Each "Signature Cake" wedding cake is a one-of-a-kind original couture cake. No two cakes are ever the same. 1. 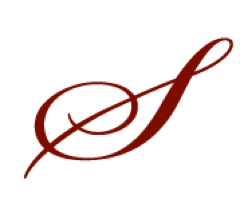 Call to set up your complimentary consultation and tasting. This time is reserved for you and your groom, mother, attendants or anyone who will help to make your decisions easier. I schedule an hour to an hour and a half of personal time so that we can discuss every idea or concept that is important in designing your cake. 2. Bring swatches of fabric, whether from your wedding or just fabrics you love. Bring pictures of cakes. Bring pictures of other elements of the wedding, such as flowers, dinnerware and venue. Bring anything that will help me understand your style and fashion sense. 3. 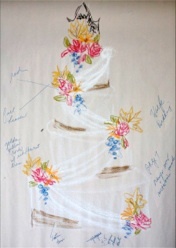 Photographs of your bridal gown, veil, shoes and jewelry can sometimes be used as an image to duplicate onto your cake. 4. Then we look through pictures of my cakes. Most of the time, brides pick many different cakes that don't seem to be similar. It can sometimes be overwhelming and confusing. My secret is to listen to what you say. Usually there are certain elements that the bride choses over and over. That's how we begin to narrow it down. 5. Once we decide on style, then it's time to decide on size, shape, and color. 6. 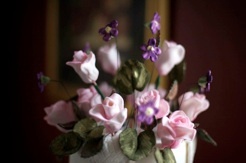 Next, we make ornamentation decisions, such as sugarpaste flowers, leaves, ribbons, draping, bows, lacework, birds, tiny shoes, crowns, monograms, or other handmade elements. We also decide where to highlight with gold, silver, lusterdust or pearlized colors. 7. In the last stages, I bring our ideas to life by drawing with oil pastels on my sketchpad, which is placed on an easel. 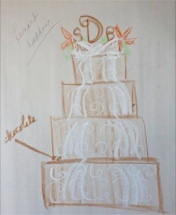 By the time we are done, we can see the detailed ideas and concepts that will become your wedding cake. 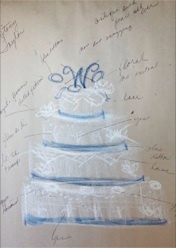 The sketch is the "blueprint for elegance" for your wedding cake.